In terms of platform economy, as it is discussed in standard works, a “real” platform unites producers and consumers without possessing the capital goods itself. At the same time, the platform users can be consumers as well as producers. Platforms establish their worth by uniting producers and consumers, who would like to exchange values. They monetise the “matching functions” in a suitable manner: by means of platform fees, commissions, advertising, additional services, etc. Here, the poster children of platform economy appear as examples for real platforms in this sense: Uber, Airbnb, Facebook, Google, with parts of their business even Amazon and Apple. 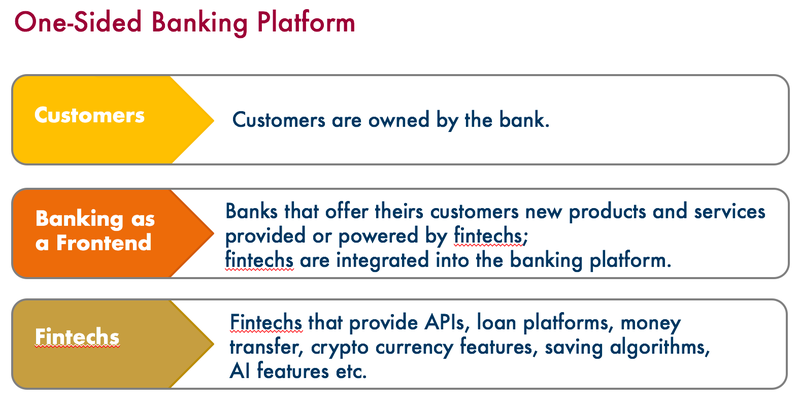 Based on this platform definition: What types of platforms are we currently dealing with in banking and which platforms comply with this definition? BaaS platforms provide non-banks with the option of offering financial products or services, which require a banking licence. BaaS platforms work like Software as a Service models, which offer transactional business processes, e.g. web shop providers, in addition to software. 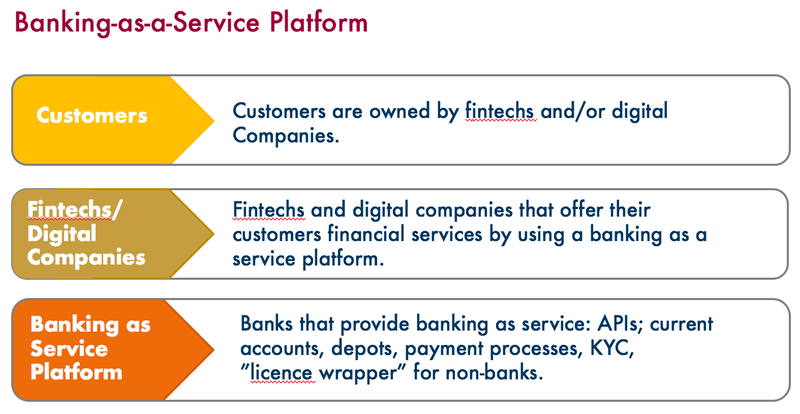 However, the role of banking platforms includes a wider spectrum than those of SaaS providers: In addition to the technology, they offer their customers the banking licence and the regulatory framework relating to issues concerning Know-Your-Customer (KYC), preventing money laundering, customer information, etc. Depending on their focus, the BaaS platforms offer classic banking products such as accounts, deposits, payment processes, securities transactions or credit granting processes; to some extent, even more complex services such as asset management. 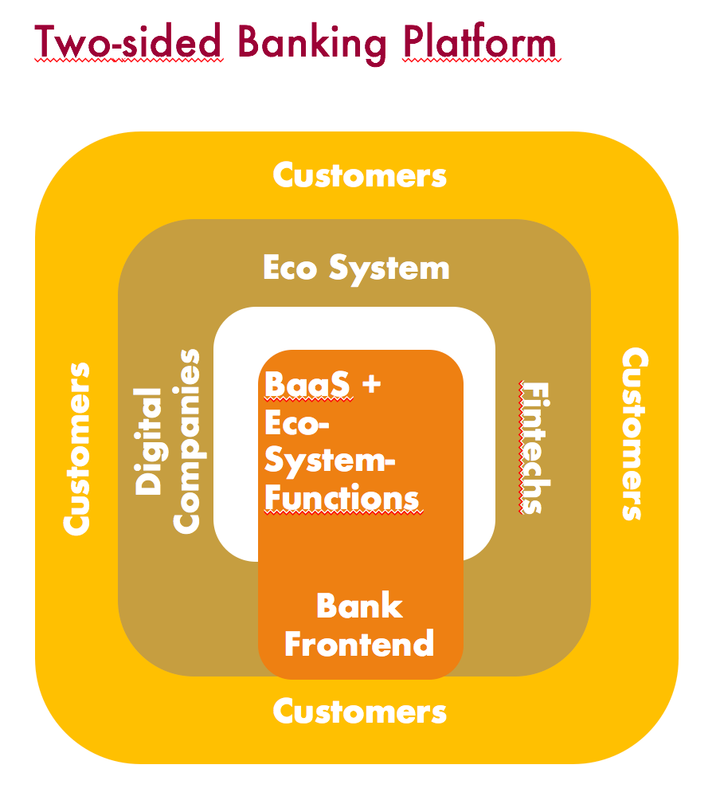 BaaS platforms played and play a leading role in the digitisation of the financial sector. Nearly every fintech works with a BaaS provider in the background, to implement its business model: These can be robo-advisors, credit marketplaces, (Peer-to-Peer) payment providers, platforms for fixed-term deposits or other start-up business process elements, which require a banking licence. From a customer’s point of view, BaaS platforms see to it that financial functions are becoming more and more incorporated into the context of life and that they are being increasingly integrated into companies’ business processes. Today for instance, consumers can very easily take out loans at the digital point of sale, invest in funds at the push of a button or simply transfer money directly to friends. Companies are able to combine payment functions directly with the rendering of services, for example supplying electricity, machine activities or transports. BaaS providers differ from “normal” banks in terms of their technical infrastructure, which they open for partners via APIs and regulatory adaptivity, to implement innovative business models within the set regulatory framework. BaaS providers differ from “normal” banks in terms of their technical infrastructure, which they open for partners via APIs and regulatory adaptivity, to implement innovative business models within the set regulatory framework. At the same time, the regulatory adaptivity must be regarded as obligatory as the API. In current platform debates, we are led to believe that an API already makes a bank a platform – it is merely a necessary technical requirement, but not a platform sufficient feature. Despite their ever-growing significance for the digitisation of banks worldwide, BaaS platforms are not platforms in terms of the platform economy. They enable banking for non-banks but do not unite “financial producers” and “financial consumers”. platforms; each with different points of focus. 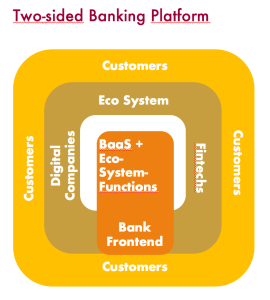 One-sided banking platforms are the inverse model for BaaS. They approach their customers as a full-fledged bank but integrate offers from partners in various ways, to be able to offer their customers new, digital services. This does point to a “real” platform in an architectural and conceptual sense. However, the lines between platform and digitised banks with a traditional business model, which merely integrate partners as product providers or service providers, are blurred. Banks have always offered financial products from other providers, for instance from investment companies or insurances. They have also always been using solutions from technology providers. The integration of fintechs such as Figo as an interface provider or Zinspilot or Deposit Solution as a platform for fixed-term deposits does not make the Deutsche Bank a banking platform for example. The Neo-Bank N26, which openly integrates its product partners as external providers on its mobile banking platform, is moving closer towards a real platform. A kind of “rule of thumb” for whether or not a one-sided platform is actually a platform in terms of platform economy, is the type of customer relations they maintain. If there are only contractual relations between the bank and the customer but none between the customer and “producer”, it is more likely the digital form of a traditional bank, not a platform bank. If original banking platforms broker direct customer relations between consumers and product providers in terms of platform economy, banking platforms primarily have two tasks: For producers, they enable offering financial products and processes as a Banking as a Service platform and for consumers, they make sure that they can very easily use these products and processes and that they can find the products and processes, which best suit their needs. Normally, customers have to go through extensive identification, documentation and information processes, to use financial products; whether for opening an account, investing in funds and securities or applying for loans. 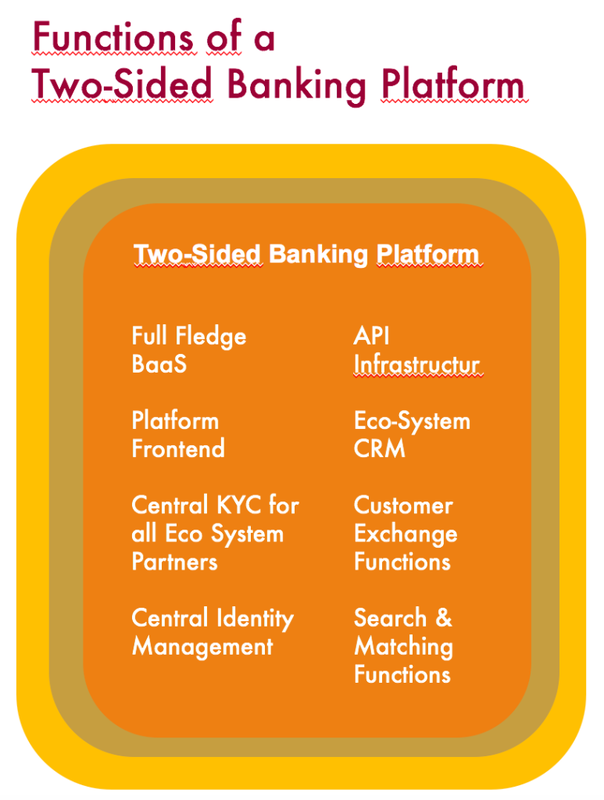 The banking platform takes care of these tasks centrally. Consequently, the consumers only need to go through these processes once, even if they would like to make use of offers from various providers. This represents an entirely new freedom and simplicity for consumers in the selection of suitable financial products, as long as their producers are connected to the banking platform. In turn, producers have the option of further monetising their customers using cooperative cross-selling campaigns with complementary platform producers and to increase their own appeal through the supplementary offers of these partners (in this sense, every platform producer becomes a kind of its own micro-platform). In addition to the technology, the ecosystem of producers, which first of all should be appealing to customers in its interaction and second of all, should benefit from one another collaboratively, is decisive for the success of a two-sided banking platform. The larger the ecosystem of collaborative producers, the more appealing the overall investment platform is for financial producers as well as financial consumers. How setting up such an ecosystem works, can currently be observed by the development of the Sutor Bank’s investment platform. On the one side, product fintechs have been established here, for instance the fixed-term deposit platform Zinspilot, the pension scheme start-up Fairr.de or the robo-advisor Gowney. Now on the “other” side of the platform, there are start-ups, which facilitate saving and investing for their customers using algorithms and simplified processes and at the same time, also access the offers of product producers. The following applies to all platform producers: the customers they canvass, belong to them. However, given that the customers are authorised at the Sutor Bank and have their deposits or accounts there, they can very easily make use of each of the other platform producers. Initial joint activities by the platform producers with the objective of exchanging customers have already taken place. A narrative of the current banking platform discussion is that the sector as a platform is resulting in the banks losing their status and roles and turning them into anonymous financial enablers. This may be correct in the case of pure BaaS platforms – although there, the brand name of the bank in the background can also be important – it is surely incorrect with regard to one- or two-sided banking platforms. They play a leading role for the customers as a central hub of the ecosystem and as an anchor of confidence, which reaches far beyond the provision of platform services. The brand strength of the bank is one of the most significant success factors for a banking platform. This is exactly what can be observed at all other successful platforms: The platform companies Airbnb, Facebook or Google belong to the companies with the highest brand value worldwide. Therefore in turn, it is extremely detrimental to Uber, that its reputation has suffered due to the CEO’s behaviour and its apparent repressive and discriminatory corporate culture. Not every bank has to implement a decided platform business model. Just like hotels and Airbnb or trade platforms and digital retailers coexist, so will traditional and platform banks. However, in addition to digitisation, there is a second driving force, which makes every bank, at least to some extent, a platform. As of 2018, the PSD forces banks to open their systems via interfaces for account information services and services triggering payments. Therefore, whether they want to or not, banks are becoming banking platforms by way of regulation, to which third-party companies have access. Banks require a platform strategy, at least to handle the PSD2. This entry was posted in Fachartikel. Bookmark the permalink.